Anyone who has ever read much music criticism will be familiar with the 'sophomore slump', the idea that artists may struggle to make a decent second album because they put all their best ideas into their first one. Often the problem results from trying so hard to recreate what was so special the first time around that they make something which seems old and tired almost as soon as it comes out. Few films better exemplify the cinematic equivalent of a sophomore slump than Star Trek Into Darkness, J.J. Abram's follow-up to his own 2009 reboot of the Star Trek franchise. It's not a bad film, though there are aspects of it which are terrible, but it tries so very hard to replicate the thrills of its predecessor that it loses much of the excitement that made it so winning. The first Abrams' Star Trek was a shrewd and keenly balanced act of cannibalism, of recycling the iconography of the original series for a new generation. Through judicious use of time travel, the film was able to posit an alternate timeline that allowed the new films to still use all the old characters, aliens races and spaceships without being beholden to the old stories. They could still use Gene Roddenberry's ship, but they didn't have to follow his course. For the second go round, Abrams and his writers, the returning Alex Kurtzmann and Roberto Orci, alongside newcomer Damon Lindelof (Lost, Prometheus) play things extremely safe and stick with what worked the first time around; there's a heavy focus on action setpieces, the tense friendship between Kirk (Chris Pine) and Spock (Zachary Quinto) and the remainder of the cast flit in and out to offer comic relief or technical flimflam to keep things moving along. They even get to square off against a shadowy villain (Benedict Cumberbatch) who plans to commit acts of mass destruction and terrorism, though this one has a bit more spark than Eric Bana's Nero ever did. It's all very slick and well-oiled, but there are times when the retreading verges on laziness, especially when the callbacks serve no purpose other than to remind people of things they liked from the first film with only minor variation. Star Trek featured a Beastie Boys track, so obviously Into Darkness needs one as well; Kirk slept with an alien woman in Star Trek, so logically he must sleep with two alien women in Into Darkness; Kirk dived from the Enterprise to a platform in the first film, so Kirk has to dive through space from the Enterprise in the sequel. (The writers go so far as to have Kirk comment on such repetition at one point, and while admitting that they have a problem is the first step, it is very far from a solution.) One of the things that made Star Trek such a pleasant surprise was how it managed to make old characters feel new again, but the constant references in Into Darkness make their actions feel dreadfully tired and familiar. That the film is largely risk averse only contributes to the sense that Into Darkness is Star Trek, only less so. While the main issue with the film is that it feels very familiar, that is not by itself a fatal flaw. It speaks to a lack of ambition, but there is something comforting about spending more time with iconic characters being played by thoroughly charming actors, and it is action-packed enough to make for a fun distraction. Problems arise when that sense of familiarity comes up against the new additions, some of which are implemented pretty well, but most of which fall flat and only serve to highlight what the first film did much, much better. Case in point: the use of Alice Eve's character Carol Marcus, who is introduced as scientist and does a more than capable job of being an interesting addition, as eye candy has been discussed ad nauseum so probably doesn't need to be raked over again, but it really is jaw-dropping in its tackiness. One of the key questions leading up to the release of the film was that of who Benedict Cumberbatch would be playing. Obviously he would be playing the villain, but which villain? The cast and crew were cagey about that fact, at various points flat out denying that he was playing Khan, the Melville-quoting superhuman played memorably by Ricardo Montalban in Star Trek II: The Wrath of Khan, a denial which pretty much everyone now knows was a bald-faced lie. Cumberbatch is a new, paler and less ethnic Khan for a new, more diverse generation of moviegoers. Progress? Now, if you didn't know that Cumberbatch plays Khan, then the previous sentence has spoiled literally nothing for you, because frankly the revelation of his identity means little in terms of the film's story. The characters don't know who Khan is, the name has no meaning to them because they've never met him before, so the 'mystery' is little more than a blatant attempt to generate discussion through advertising as a twist something which is not, in fact, a twist. Much like the alien in Abrams' previous film, Super 8, the mystery doesn't serve the story. If anything, it hurts it because it sets up a revelation which can only be anticlimactic; it builds up something which is wholly incidental into seeming like it actually matters. The secrecy surrounding Khan has nothing to do with making a good film, and everything to do with selling an average one. Having said all this, Cumberbatch isn't bad as Khan - he's a menacing presence who is convincing as a mental and physical match for Kirk - and he is even used in an interesting way, shifting from being Star Trek's Joker to its Hannibal Lecter. He goes from anarchist to arch manipulator over the course of the story, seeming to help the Enterprise's crew while really furthering his own quest for revenge, and Cumberbatch plays each note of that progression with aplomb. Khan is problematic not because of the performance, but because of how he is used - as a way of introducing the Klingons, another iconic aspect of classic Star Trek, then just as quickly disposing of them, in the process giving short shrift to indelible creatures while enabling an unnecessarily busy political plot involving an admiral (Peter Weller) which weighs the whole thing down terribly. But the worst aspect of the Khan character is that he gives license for Abrams and co. to not only cannibalise their own previous film, but also Wrath of Khan, still the pinnacle of the Star Trek cinematic series. You can only consume your own flesh for so long before you start to get very sick, and Star Trek Into Darkness starts to look a little wan and unsteady around about the time that it steals one of the most emotionally resonant scenes from Wrath of Khan and more or less recreates it wholesale. The scene itself is played well and the actors involved wring every ounce of emotion they can out of it, but it's terribly manipulative on the part of everyone involved to copy an earlier moment, pass it off as homage while using the power of the earlier film to bolster their own. The old Star Trek films were somewhat notorious for reusing footage of space battles to save money. 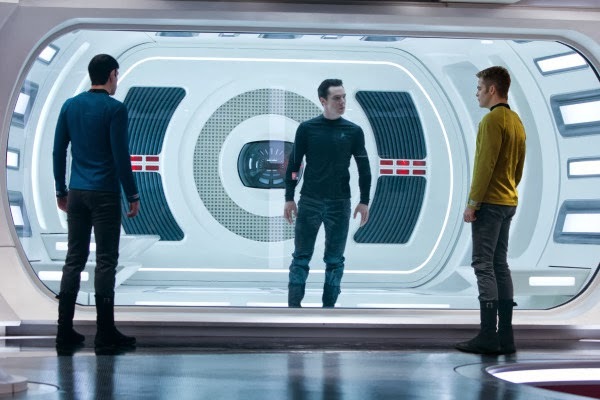 Star Trek Into Darkness pulls basically the same trick out of pure, unbridled cynicism. Star Trek Into Darkness is a solid action film with some well-judged performances, occasional flashes of wit and a light, zippy tone that makes it a fun way to pass two hours. It's also at times staggeringly lazy, cynical and weighed down by a baggy, unfocused screenplay. It has all the key ingredients of its predecessor, but with a few new ones that ultimately leave a sour aftertaste.